American exceptionalism is the view that the United States occupies a special role among the nations of the world in terms of its national ethos, political, economic and religious institutions, and its being built by immigrants. The roots of the position date back to 1630 with John Winthrop’s “City Upon a Hill”, although some scholars also attribute it to a passage of Alexis de Tocqueville, who argued that the United States held a special place among nations, because it was the first working representative democracy. Belief in American exceptionalism has long been characteristic of both conservatives and liberals. The radical Marxist, Howard Zinn however said that it is based on a myth, and that “there is a growing refusal to accept” the idea of exceptionalism both nationally and internationally. But he of course is dead wrong! Many intellectuals, across disciplines have argued that to deny American exceptionalism is in essence to deny the heart and soul of this nation. 1. The Protestant American Christian belief that American progress would lead to the Millennium. 2. The American writers who linked our history to the development of liberty in Anglo Saxon England, even back to the traditions of the Teutonic tribes that conquered the Western Roman Empire. 3. Other American writers who looked to the “newness” of America, seeing the mass of “virgin land” that promised an escape from the decay that befell earlier republics. Because America lacks a feudal tradition of landed estates with inherited nobility, it is arguably unique among nations. The Puritan Calvinists who first came to Massachusetts had a strong belief in predestination and a theology of Devine Providence that still has effects down to this day. Since God made a covenant with his ‘chosen people’, Americans are seen as of a different type. This “City on a Hill” mentality is still evidenced in American folklore, song and customs (“This land is my land, this land is your land, from the redwood forests to the gulfstream waters”). With its particular attention to immigration, America has generation after generation been a beacon to the world. The Statue of Liberty is an embodiment of that ethos. America was also created on a vast frontier where rugged and untamed conditions gave birth to the American national identity and the narrative of a continent of exceptional people—explorers and adventurers. Think of my relative, Teddy Roosevelt on winning the West!. The economics of the American Founding was very much a Lockean affair: the protection of property rights in what was “the largest contiguous area of free trade in the world.” But you recall there were two competing views of America’s economy: a Southern Agrarian view, championed by Jefferson, and a Northern industrial or commercial view, championed by Hamilton. It is this same difference in visions that was at the economic root of the American Civil War, a war that saw the ultimate industrial and commercial view victorious. A republic…promises the cure for which we are seeking…. the same advantage, which a republic has over a democracy in controlling the effects of faction, is enjoyed by a large over a small republic. In order to be a fit participant in a modern republic and market society, like America, it is necessary to be a certain kind of person in a certain kind of culture. This kind of person is one who internalizes their values and makes them work: a person of virtuous character. It is no accident that Max Weber identifies none other than Benjamin Franklin as the epitome of the Protestant work ethic. Nor is it an accident that America remains the most philanthropic country in the world. Franklin was the quintessential American, an entrepreneur in every sense of the word and a proponent of both thrift as a virtue and generosity as a practice. Finally, as the Nobel Prize winning author, V.S. Naipaul has put it, the “idea of the pursuit of happiness…is an elastic idea; it fits all men. It implies a certain kind of society, a certain kind of awakened spirit. I don’t imagine my father’s parents would have been able to understand the idea. So much is contained in it: the idea of the individual, responsibility, and choice, the life of the intellect, the idea of vocation and perfectibility and achievement. It is an immense human idea. It cannot be reduced to a fixed system. It cannot generate fanaticism. But it is known to exist; and because of that, other more rigid systems in the end blow away.” One does not impose personal autonomy, and that is the secret of America’s real and lasting power. Human flourishing is an American moral theory, which links virtue and happiness specifying the relation between these two concepts as one of the central preoccupations of ethics. Virtue ethics today has been revived and largely on account of the American spiritual capital built up as a legacy over many centuries of eudamonic thinking and practice. American exceptionalism is the very embodiment or the exemplar of the logic of modernity. In Lincoln’s famous phrase, “American is the last, best hope of mankind.” And, to the extent that the logic of modernity is rooted in Judeo-Christian spiritual capital, America is unique in preserving that connection. Americans continue to identify themselves overwhelmingly with the Judeo-Christian spiritual heritage; long after it has disappeared as the cultural foundation of Western Europe. That is why most Americans subscribe to the Lockean liberty narrative not the social democratic equality narrative that now dominates Europe; it is why America can combine a secular civil association with a religious culture instead of the belief in a theocracy; it is why America celebrates autonomy instead of the Asian belief in social conformity. One way of characterizing the early United States is to say that it inherited the logic of modernity and all of its institutions (the technological project [from Francis Bacon], economic freedom [from Adam Smith], political freedom [from John Locke], and legal freedom [common law]) from Great Britain. What distinguished the U.S. from England were three crucial things: (a) the lack of a feudal class structure which dominated Great Britain down into the 20th century (yes, we all love Downton Abbey but…); (b) an extensive virgin territory for applying it (The Louisiana Purchase); and, most especially, (c) the opportunity for a multitude of dissenting Protestant sects, Catholics, and Jews to engage the new world with a religious fervor largely absent from the feudalistic State Churches of Europe. It is important to remember how many of the original settlers were from dissenting Protestant sects such as the Puritans, Methodists, Baptists, and Quakers. This early influence can be seen in the sermons preached during the American War of Independence, the Declaration of Independence, and throughout the rest of U.S. history. Here is a brief sampling. John Adams, “Statesmen may plan and speculate for liberty, but it is Religion and Morality alone which can establish the Principles upon which Freedom can securely stand. In 1952 President-Elect Dwight Eisenhower acknowledged that the “Judeo-Christian concept” is the “deeply religious faith” on which “our sense of government…is founded”. “Under God” was added to the pledge of allegiance in 1954. Presidents take the oath of office on both an Old and New Testament Bible. America exemplifies the logic of modernity par excellence. That is why there is such a thing as the American Dream—which continues to draw people to our exceptional shores from the world over. For those among you who are want to pose the question empirically: “do Americans see themselves as exceptional” you can look at the results of a very recent December 2012 Gallup Poll. It turns out that Americans widely agree that the United States has a unique character because of its history and Constitution that sets it apart from other nations as the greatest in the world. This view, commonly referred to as “U.S. exceptionalism,” is shared by at least 80% of Americans in all party groups, including 91% of Republicans. One of the extensions of the belief in American exceptionalism is the notion that, because of its status, the United States has an obligation to be the leading nation in world affairs. Americans generally endorse this position, as 66% say the United States has “a special responsibility to be the leading nation in world affairs.” Republicans, Democrats, and independents generally agree, with fairly modest differences among party supporters. 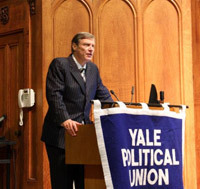 My friends, Yale students and pundits everywhere along the Yale Political Union party spectrum: embrace American exceptionalism.